PiercingMetal Thoughts: Sold! This really looks exciting to me and has a real dark vibe that I think is going to open up some interesting story doors across the film. I liked this trailer a lot more than I remembered my feelings about “The Force Awakens” one and truth be told I wasn’t 100% crazy about that film. That being said this one looks to be a whole lot of thrills. What did you think of it? Chime in down below in the comments section. You know I love to hear your views. With the big “Star Wars Celebration” event going on down in Florida at the moment, I should have anticipated that we would get our first glimpse at the upcoming “Star Wars: The Last Jedi” film. This one takes place immediately after the events of “Star Wars: The Force Awakens” and well, here is the teaser. Get excited. 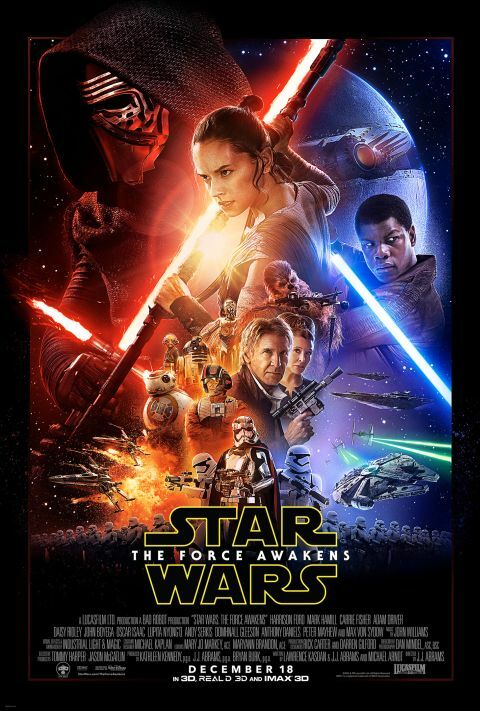 The wait is over at long last, you are no longer anxiously awaiting the continuing adventures from a long time ago in a galaxy far, far away because the 7th installment in the “Star Wars” franchise arrives with “Star Wars: The Force Awakens” which opens up in more theaters than you can possibly imagine today. Now there was an LA premiere a couple of days ago and I am sure some members of the media were at exclusive screenings (you lucky ducks) but the focus in on the masses of humanity that are slavering and checking their watches to coordinate their own attendance. Check out the poster, a reminder of the premise for those under a rock and the cast before I return to offer up some additional thoughts on it all. The Force Awakens is set approximately 30 years after the events of Return of the Jedi, and features new leads Finn, Rey, and Poe Dameron alongside characters returning from previous Star Wars films. Additionally, Crystal Clarke, Pip Andersen, Christina Chong, Miltos Yerolemou, Greg Grunberg, Warwick Davis, Billie Lourd, Maisie Richardson-Sellers, Iko Uwais, Yayan Ruhian, Cecep Arif Rahman, Amybeth Hargreaves, Leanne Best, Jessica Henwick, and Simon Pegg were cast in unspecified roles. PiercingMetal Thoughts: Considering I’m one of the people that fell into the smallest factions that did NOT take advantage of purchasing tickets when they went on sale a couple of months ago I feel that I am not going to be able to see the new Star Wars until February or March based on the demand. I’ll ask those readers who might somehow feel compelled about commenting in on this post about it to leave it to stuff along the lines of “I loved it, its great” or “OMG that made me want Jar Jar Binks back” as opposed to any significant plot developments or deeper secret reveals. I’ve had my hands full with all the constant spoilers of “The Walking Dead” to contend with and don’t want this guilty pleasure ruined for me as well. So what are your plans this opening day? Will you see the film at some point today or are you one of the lucky ones who managed to see it in some kind of exclusive screening or in Los Angeles the other day? Whatever the case may be let me know in the comments below. Perhaps I will try and sneak an early matinee on a day when I am hoping no one else will be hitting the film before my myriad of Fellow Facebook Geeks force me to turn off my profile for a month. May The Force be with you…..always.